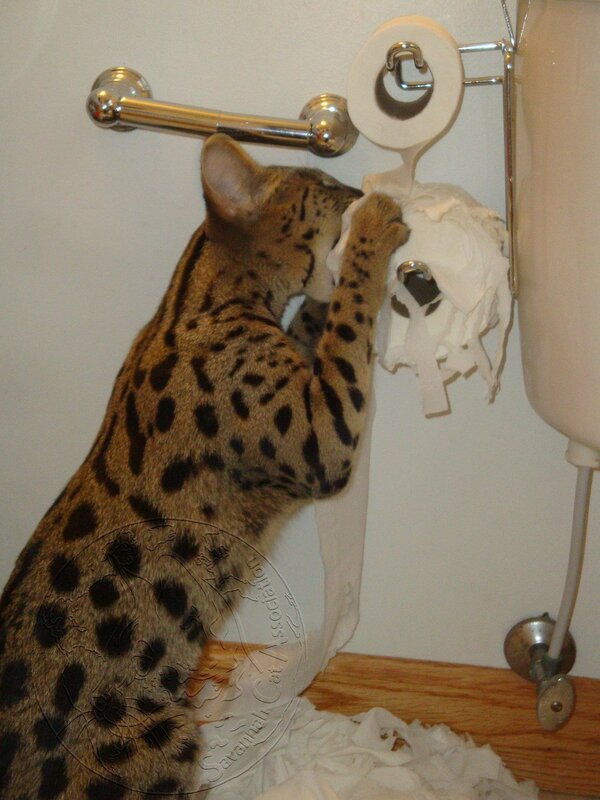 Are Savannah Cats really destructive? First, let us define the term “destructive”. Able to crush tall buildings with a single blow of their paw? Faster than the bathroom door closing when you want to be alone? More powerful than the toilet paper roll that they are chasing down the hallway? Or just a permanent two-year-old wrapped up in a fuzzy spotted ball of fur? Savannah cats are highly intelligent. Which means that they are easily bored. Boredom can lead to what people would term as destructiveness. Shredded paper towels, clothes yanked from drawers, shower curtains in a pile on the bathroom floor, etc. In order to help dispel that energy, play is at the top of the list. Savannahs are up for anything. Teach them to play fetch. Feather toys are always a winner. Hide and seek is a game they can become quite good at. Even something as simple as yarn tied to a doorknob. Also, constructing an environment that is stimulating is a good idea. It does not have to be expensive, just things that they can play with and satisfy their natural curiosity. Get creative! Savannah Kitten Care States That Allow, Disallow or Permit Savannah Cats Vaccines for Savannah Cats Why are Savannah Cats expensive?